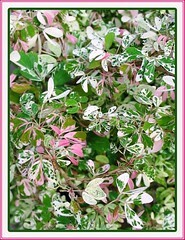 The foliage of Variegated Madras Thorn is so attractive, with its captivating mix of pink, white and green. It is definitely an ornamental beauty to brighten any dullness in gardens and landscapes. Light: Full sun for best performance, though can tolerate partial sun to full shade. Moisture: Needs regular watering and moderately. However, it is drought and salt tolerant too, thus can survive in dry climates and coastlines. Soil: Grows best in fertile and well-drained loamy soil though highly adaptable to any kind including clay, limestone and sand or poor, depleted soils. Propagation: Can be propagated from stem cuttings which are easy to root or germination of seeds which take about 7-10 days. Natural reproduction abounds as it freely self-sow from the burst ripen pods, as such listed as weed or pest plants in some regions. 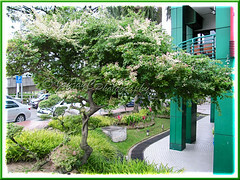 Features: Variegated Madras Thorn though a fast-growing tree reaching an average height of 10 feet or more, is a smaller species as compared to Pithecellobium dulce that ranges from 5-20 meters in height. This variegated version is an attractive tree that is planted in many tropical areas as an ornamental foliage shrub or shade tree. 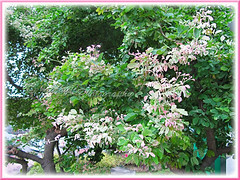 Beautiful bipinnate leaves with 2 pairs of 2 kidney-shaped leaflets in various shades of white, pink and green, either in patches, whole or patterned adorn its irregular grey branches that has a spreading habit. A deciduous tree but seemingly evergreen as new leaves grow whilst old leaves are being shed. A pair of short sharp spines are at the base of each leaf. Flowers are small (1cm across) and greenish-white in globose heads arranged in panicles. Fruit is a pod, that spirals and turn reddish-brown as it ripens. 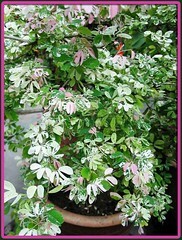 Usage: Pithecellobium dulce ‘Variegated’ being smaller will be very ideal as a foundation shrub, courtyard tree or an attractive outdoor specimen in gardens and landscapes. Popularly used for dwarfing as a bonsai plant or plant sculpturing as a topiary or as an ornamental shrub in container for patio or stand alone indoor specimen. Generally, P. dulce (Madras Thorn) has many uses besides being cultivated as hedges, shade tree or fence post. Its uses include food and drinks from the sweet pods, fodder from leaves and pods of sheared hedges, firewood, honey from flowers by visiting bees, gum, dye and tannin from bark, soap oil from seeds, and other medicinal benefits. Care: Quite a fuss-free shrub or tree that requires minimal care. Just an occasional trim to maintain shape and height. However, do watch out for caterpillars that enjoy devouring its leaves and white flies that are attracted to it. For temperate zones: Hardiness – USDA Zone 10a-11, referred here. More information: To know more on Pithecellobium dulce, view this very informative tree species reference from the Agroforestree (AFT) Database of World Agroforestry Centre. Murraya koenigii whose leaves are a must in curries! From Thailand. I was interested Pithecellobiume ‘Variegated’ (Variegated Madras Thorn, Manila Tamarind) very much. i saw from web. So may I order it and how much is it. Sorry Praserd, we’re just home gardeners, not sellers. 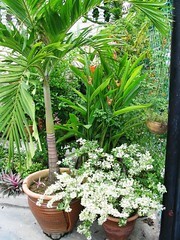 mine are not for sale but we can barter with other ornamental; varieties . . .